This film is Rated JPB = Just Plain Boring. How could it be this boring, I wondered? The plot of Ben Hur was well-known, and the actors were for the most part, unknowns-it turns out for good reason. The one known actor, Morgan Freeman, did the walk-through of his life to pick up a paycheck. He put more emotion into the commercials I’ve seen him in than what was on display in this film. 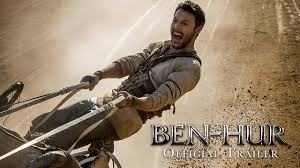 The story line leads Judah Ben-Hur to a slave galley and then back to his hometown of Jerusalem, where he miraculously feels compelled to produce this special sword which was given to him by his nemesis, Messala, who is also his adopted brother. The problem with this is that Judah has been a slave for the past five years, with no sign of that sword tucked away. One cannot help but wonder if these small details escaped the notice of the writers and producers of this production? The problem, I would put forth, is mostly with the shoddy writing. But it doesn’t stop there. Not only is the screenplay badly written, but the film is also sloppily edited and poorly acted to boot. Even the CGI (Computer Graphic Imaging) and Special Effects during the Climactic Chariot Race come across as looking stilted and phony. In short, give this updated version of Ben-Hur a miss and rent the fifties classic with Charlton Heston and Stephen Boyd. That one may be corny but it’s imminently more watchable than this boring thing.